Fluoride is a negatively charged ion (anion) of the chemical element fluorine. It naturally appears in water and certain foods; in some countries, it is added to water (water fluoridation) or salt (salt fluoridation). Fluoride is not considered an essential nutrient, but it can help prevent dental caries in children and adults . The chemical symbol for fluoride is F–. Fluoride that is absorbed into the tooth enamel changes some of the mineral hydroxyapatite into fluorapatite, which is more resistant to the acids produced by the mouth bacteria . In children until 8 years of age, fluoride from the blood can be incorporated into the enamel of the primary teeth and of the permanent teeth before they erupt . After age of 8, the fluoride that is absorbed and secreted into the saliva and fluoride from toothpaste stimulate the incorporation of calcium and phosphate into the surface of the tooth enamel of both primary and permanent teeth; small amounts of fluoride are also incorporated into the enamel . Fluoride absorbed into the bones also forms fluorapatite. It is currently not clear if fluoride has any beneficial effect on the human bones . How much fluoride do you need? Fluoride is not an essential nutrient to human health, but low fluoride intakes have been associated with an increased risk of dental caries . The Institute of Medicine in the U.S. has set the Adequate Intake (AI) for fluoride as the intake that helps to prevent dental caries. Most foods naturally contain less than 0.3 mg of fluoride per serving . In most parts of the United States, non-fluoridated tap water contains less than 0.4 mg fluoride/liter , but in certain parts of New Mexico, Nevada, Arizona, California, Utah, and other areas, it may contain more than 1.2 mg/liter, so even more than fluoridated water. In certain parts of Africa, China, India, Middle East and Mexico, non-fluoridated water may contain more than 10 or even more than 40 mg fluoride/liter, which can, after regular drinking, cause severe dental or skeletal fluorosis. 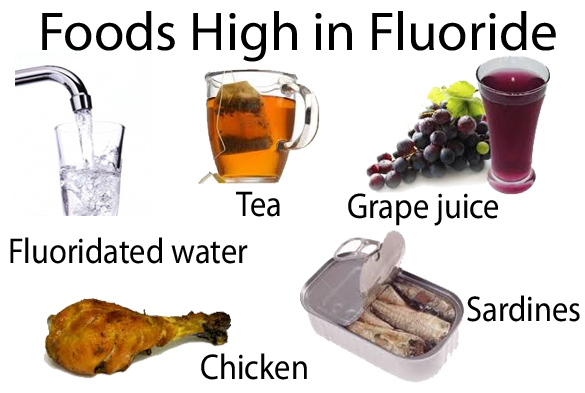 The World Health Organization (WHO) has set the standard maximum fluoride concentration in drinking water to avoid dental fluorosis at 1.5 mg/liter . The U.S. Environmental Protection Agency (EPA) has set the Maximum Contaminant Level (MCL) for fluoride upon prevention of crippling skeletal fluorosis at 4 mg/liter [16,17] and the Secondary Maximum Contaminant Level (SMCL) upon prevention of moderate and severe dental fluorosis at 2 mg/liter . In the United States, fluoridated water contains 0.7-1,2 mg fluoride/liter . The U.S. Department of Health and Human Services has recently recommended the optimal concentration in drinking water 0.7 mg/liter in order to reduce the risk of dental fluorosis . Water is also fluoridated in certain parts of Australia, Brazil, Canada, Chile, Colombia, Hong Kong, Ireland, Israel, Malaysia, New Zealand, Singapore, UK and in some other countries, but usually not in the continental Europe . Fluoride in fluoridated water can be in the form of sodium fluoride (NaF), fluorosilicic acid (H2SiF6) or sodium fluorosilicate (Na2SiF6). Fluoridated water has no specific smell, taste or appearance. To find out if the drinking water you use is fluoridated or not, you can contact your water supplier. To test the concentration of fluoride in the tap or well water, you can contact the local health authorities or a private laboratory. Commercial kits for testing fluoride amount in water are also available. In some parts of the U.S., non-fluoridated municipal water may contain up to 4 mg of fluoride/L, and well water may contain even more, so you might want to remove the excessive fluoride to prevent dental and skeletal fluorosis. Fluoride removal systems based on reverse osmosis remove about 80% of fluoride from water . Systems for one faucet or the whole house are available. Excessive fluoride needs to be removed only from drinking and cooking water; fluoride from bathing water does not cross the skin and causes no known harm to the body. Apart from fluoride, reverse osmosis removes some other minerals, such as arsenic, calcium, magnesium, phosphate, nitrate and sulfate from the water, which therefore has a bland taste. Boiling or freezing does not reduce the amount of fluoride in the water. Water softeners intended to treat hard water, Brita-type filters, activated charcoal units and UV light exposure do not remove fluoride from water [1,33]. Sea water desalination removes most fluoride from water . Most bottled waters in the United States are low in fluoride (<0.4 mg/L)  but certain mineral waters are naturally high in fluoride; the producers are not obligated to reveal the levels of fluoride in these waters. To find out the fluoride concentration in a certain brand of bottled water, you can contact the water producer. Fluoridated bottled waters are also available; fluoride levels in these waters should be revealed on the labels. Soft drinks and fruit juices may be prepared with fluoridated or non-fluoridated water; they often contain more than 0.6 mg fluoride/liter [6,33]. Fluoridated milk programs for children run in some kindergartens and schools in the areas with non-fluoridated water in UK, Bulgaria, Macedonia, Russia, China, Thailand and Chile . Fluoridated yogurts are available in some schools. One study in China has found an association between drinking fluoridated milk and reduced occurrence of tooth decay in primary teeth , but insufficient studies have been made to conclude whether fluoridated milk helps to prevent dental caries or not [3,9]. In some countries, where water is not fluoridated (Austria, Czech Republic, France, Germany, Hungary, Japan, Slovakia, Spain, Switzerland and certain parts of India, Central and South America and Middle East), fluoride is added to table salt . Usually, there is about 2 mg of fluoride in 10 grams of salt (a usual daily salt intake). There is insufficient evidence about effectiveness of fluoridated salt in prevention of dental caries . Over 80% of the ingested fluoride is absorbed in the stomach and small intestine . About one half of the absorbed fluoride is excreted in the urine ; the rest of it is incorporated into the developing teeth (until 8 years of age) and bones. Fluoride is not irreversibly bond to bone, which means that at low intake, fluoride can be released from bone and excreted with the urine . The only negative effect of an inadequate fluoride intake clearly recognized so far is an increased risk of tooth decay in all age groups . Fluoridated toothpastes contain either sodium fluoride or monofluorophosphate. Fluoridated toothpaste reduces the harmful effect of bacteria on the tooth enamel and can even treat a mild tooth decay (white spots) by enhancing enamel remineralization . Some doctors think children under 2 years of age should not use fluoridated toothpaste in order to avoid dental fluorosis . Fluoride from the toothpaste applied to the teeth does not cause dental fluorosis, but when children younger than 8 years swallow it, the absorbed fluoride may be incorporated into their teeth and cause dental fluorosis. Children may ingest up to 1 mg of fluoride with each brushing, so parents should instruct them to use only a pea-sized amount of toothpaste. A pea-sized application (1 gram) of over-the-counter (OTC) fluoridated toothpaste usually contains 1.0-1.5 mg of fluoride (1,000-1,500 ppm). According to the studies performed at The University of Manchester, fluoridated toothpastes are, in average, 24% more effective in preventing tooth decay than non-fluoridated toothpastes . Low-fluoride toothpastes that contain less than 1000 ppm fluoride are probably no more effective than non-fluoridated toothpastes . A pea-sized application of a prescription (medicinal) toothpaste may contain 1.5-5 mg of fluoride (1,000-5,000 ppm). It is intended for individuals older than 6 years of age with a strong personal or family history of tooth decay. One 2009 Cochrane review suggests that a regular use of fluoridated mouthrinse can reduce the risk of caries in children . Fluoride mouth rinses are intended for individuals older than 6 years of age living in the areas with low fluoride levels in tap water who are at high risk of developing tooth decay . Over-the counter (OTC) fluoride mouthrinses for home use contain 0.05% sodium fluoride (NaF) or stannous fluoride (SnF2). Mouthrinses containing 0.2% sodium fluoride are sometimes used in school-based weekly rinsing programs. According to one 2015 Cochrane review, there is a moderate evidence that fluoride gel can help prevent caries in the permanent teeth . Fluoride gel or foam containing phosphate, sodium or stannous fluoride at concentrations ranging from around 0.1 to 1% can be applied by a dentist for 1-4 minutes in 3-12 month intervals onto the teeth of children older than 6 years of age at high risk of developing tooth decay. Because of an infrequent use, fluoride gels and foams do not likely cause dental fluorosis . According to one Cochrane review, there is a moderate quality evidence that applying fluoride varnish in children and adolescents can help prevent tooth decay in primary and permanent teeth . A non-permanent fluoride varnish containing sodium fluoride (2.26%) or difluorsilane (0.1%) may be applied by a dentist directly onto the teeth twice a year. It is intended for children older than 6 years, living in areas with non-fluoridated water, who are at a high risk of developing tooth decay. Varnishes contain only small amount of fluoride, so they do not likely cause dental fluorosis . Fluoride supplements containing sodium fluoride or monofluorophosphate in the form of chewable tablets, lozenges or fluoride/vitamin preparations may be prescribed to children 6 months to 16 years of age who live in the areas with a low concentration of fluoride in the drinking water and are at high risk of developing dental caries . Children who drink fluoridated water should not receive fluoride supplements, otherwise they may develop dental fluorosis. Some researchers believe that fluoride supplements do not prevent tooth decay in the primary teeth and they should not be prescribed to children under 6 yeas of age . Fluoride supplements can help prevent tooth decay in both children and adults [1,38]. Fluoride can also treat white spots–the initial phase of a tooth decay caused by bacteria–but cannot treat developed cavities [*]. The exact effect of fluoride on the bone strength is not yet clear; treatment of osteoporosis with fluoride supplements has not given satisfying results so far . From 136,000 children 5–15 years of age included in the survey, those living in the areas with more than 0.7 mg of fluoride/liter of drinking water had less dental caries (6.9% in the primary teeth and 12.7% in the permanent teeth), than those living in the areas with less than 0.3 mg of fluoride/liter (65.3% in the primary teeth and 50.6% in the permanent teeth), regardless of whether they lived in metropolitan, rural or remote locations. In a 2012 systematic review of studies published worldwide from 1990-2010, all 59 studies showed a significant reduction in tooth decay from water fluoridation, with most showing reductions of around 20-60%. According to one 2013 review of studies in Australian adults, caries-preventive effects of water fluoridation were at least as great in the adults born before 1960 (before widespread implementation of fluoridation) as in the adults born between 1960 and 1990 (after widespread implementation of fluoridation). According to the 2015 Cochrane systematic review of prospective studies, initiation of water fluoridation results in 35% decrease of caries in children and 26% decrease in adults . Since majority of the reviewed studies was performed before 1975, that is before widespread use of fluoridated toothpaste, the reviewers cannot conclude what is the exact current effect of water fluoridation on tooth decay . Fluoride gel, varnish and mouthrinse by themselves may be effective in prevention of tooth decay, but do not appear to add a lot of benefit to those who already use fluoridated toothpaste . The only proven side effect of water fluoridation is dental fluorosis . Water fluoridation at 1 mg/L is usually not associated with the level of dental fluorosis that would be of public concern . No other side effects, including asthma, allergic reactions or increased risk for birth defects, Alzheimer’s disease or Down syndrome, behavioral changes in children, cancer, including the bone cancer osteosarcoma, heart, kidney, liver or thyroid disease or skeletal fluorosis due to drinking fluoridated water have been confirmed so far [1,4,33,34]. Individuals who were regularly consuming excessive amount of fluoride before the age of 8 may have dental fluorosis with discoloration of the permanent teeth [8,33]. The second and third year of life are the most critical period to develop dental fluorosis . Susceptibility for dental fluorosis is genetically determined [*]. One study has shown that in the areas where water has contained about 1 mg of fluoride/liter, about 10% of population have had a mild dental fluorosis, and where it contained about 2 mg/liter, about 5% have had moderate fluorosis . According to the National Health and Nutrition Examination Survey, 1999-2004, in the US, 23% of people aged 6-49 years had some degree of dental fluorosis . Mild dental fluorosis with a slight whitish or brownish teeth discoloration may result from a long-term drinking of large amounts of water, tea or soft drinks containing as low as 1 mg of fluoride/liter, from adding fluoridated water to infant formula mixes, swallowing fluoridated toothpaste, or excessive use of fluoride supplements . The teeth with mild fluorosis are more resistant to caries than the teeth without fluorosis . Moderate or severe dental fluorosis with an obvious brown discoloration, enamel pitting or loss may result from a long-term drinking of large amounts of water or tea containing as low as 2 mg of fluoride/liter, or regular consuming of jowar (a common Indian cereal). The teeth with severe fluorosis are more susceptible for caries than the teeth without fluorosis . Some pediatricians advise that children up to 8 years of age should not consume more than 0.05 to 0.07 mg of fluoride by kilogram of body weight per day in order to minimize the risk of dental fluorosis . Infant formula concentrates prepared with water: 0.1-1 mg/day. Concentrates mixed with fluoridated water or tap water containing more than 0.7 mg fluoride/L used on a regular basis may cause dental fluorosis, so you might want to mix them half-half with bottled, purified, demineralized, deionized or distilled water or water filtered by reverse osmosis, which are all low in fluoride . Fluoride supplements may be toxic when consumed in doses greater than 5 mg/kg body weight, and fatal in doses over 15 mg/kg body weight; symptoms of acute toxicity include vomiting, diarrhea, excessive tearing and salivation and weakness . Skeletal fluorosis refers to accumulation of fluoride in bone that results in bone hardening (osteosclerosis) and eventual related symptoms. In the preclinical stage, there are no symptoms, but an X-ray reveals dense bones . One 1957 survey of radiographs of 170,000 individuals from Oklahoma and Texas, US, living in the areas with drinking water naturally containing 4-8 mg of fluoride/L revealed 23 cases of dense bones (osteosclerosis) . Stage 1 skeletal fluorosis includes osteosclerosis, sporadic pain and joint stiffness . In one case, a 54-year old woman who was consuming water containing 8 mg of fluoride/L for 7 years had osteosclerosis and stiffness in the knees and hips . Stage 2 skeletal fluorosis can present with chronic joint pain, arthritic symptoms, slight calcification of ligaments and muscle tendons, osteosclerosis and eventual osteoporosis of long bones [18,33]. 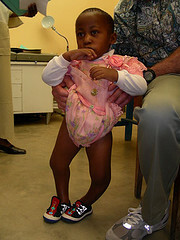 Stage 3 or crippling skeletal fluorosis involves limitation of joint movement, calcification of ligaments, neck and vertebral column, crippling deformities of spine and major joints, muscle wasting, neurological defects or compression of spinal cord and, in children, bone deformities . Crippling skeletal fluorosis may develop in individuals who were consuming more than 10 mg/day for at least 10 years [1,18]. It usually occurs only in people living in the areas with fluoride concentrations of natural drinking water exceeding 10 mg/L (east Africa, India, China, Mexico) . NOTE: There are no known cases of skeletal fluorosis due to consumption of fluoridated water in the U.S. . The tolerable upper intake levels from the Institute of Medicine are fraudulent, and this article is highly irresponsible. I have asked many forced-fluoridation fanatics to tell me how much accumulated fluoride in the body they think is safe. So far not a single one of them has been able to answer the question. The tolerable upper intake is certainly set high because it considers only the risk of crippling skeletal fluorosis and not the milder forms and dental fluorosis. EPA has set the secondary maximal contaminant level for fluoride to 2 mg/liter of water, which should prevent moderate dental fluorosis. Not only does the tolerable upper intake level consider only the risk of the crippling, third stage of skeletal fluorosis, it is based on a document which says that crippling skeletal fluorosis can occur after exposure to the tolerable upper intake level for as little as 10 years. That is really quite bizarre, because people do not suddenly stop accumulating fluoride in their bones after 10 years, and the figure seems to have been plucked from thin air. It appears to be based largely on the work of Harold Hodge, who has been completely discredited by his experimentation on children without consent at the Strong Memorial Hospital in Rochester, New York, as documented by Eileen Welsome and Christopher Bryson. The 2006 US National Research Council report Fluoride in Drinking Water: A Scientific Review of EPA’s Standards categorised the second stage of skeletal fluorosis as an adverse health effect. Perhaps the question of whether or not the first stage of the disease should be considered an adverse health effect is debatable, but no-one in their right mind would want first stage skeletal fluorosis. EPA’s SMCL of 2 mg/L is the secondary maximum contaminant level, not the secondary maximal concentration level, and the 2006 NRC report did not find that it prevents moderate dental fluorosis. Fluoride does not belong in a review of nutrients. It is a cumulative poison and development neurotoxicant, like lead, arsenic, and mercury, and not a nutrient. According to The Scientific Review of EPA’s Standards, the MCLG for fluoride 4 mg/L should be lowered, but EPA itself has not lowered it yet. I agree, the 2nd stage of skeletal fluorosis, and even moderate dental fluorosis can be considered adverse effects. Linus Pauling Institute lists fluoride as a nutrient and mentions studies in which water fluoridation was associated with a decrease in dental caries. The studies were not randomized controlled clinical trials, so the cause-effect relationship has not been clearly established so far, though. I have not seen a serious study or review of studies that would prove that fluoride does not prevent dental caries. Fluoride in high doses certainly can be a cumulative poison. The same way, like iron and copper can be, but this does not mean they should not be called nutrients. Fluoride is a cumulative poison at the doses to which people subjected to forced-fluoridation are routinely exposed. Iron and copper and other nutrients do not accumulate in the body at healthy doses, and if they are accumulating you have a problem. The idea that fluoride is a nutrient was officially debunked a long time ago. People have perfectly healthy teeth and bones without it. I agree more studies need to be done about effectiveness of water fluoridation on teeth health. According to observational studies in the eighties, the prevalence of caries in fluoridated areas in in the United States, Australia, Britain, Canada, Ireland, and New Zealand was lower than in nonfluoridated areas. Drinking water with current fluoride levels in fluoridated water in the US can cause mild dental fluorosis, and the US Department of Health and Human Services has suggested to reduce these levels from the current 0.7-1.2 mg/L to 0.7 mg/L for the entire US. We here on Nutrients Review think a substance can be called a nutrient when it can be beneficial for health, even if it is not essential for health. Evidently you don’t understand what a nutrient is. A chemical can only be a nutrient without being an essential nutrient if it is not required in the diet because the body can produce it from other chemicals. Fluoride is a chemical element so it cannot be produced by the body, which means it must be either an essential nutrient or not a nutrient at all. Since fluoride is not an essential nutrient, it cannot be a nutrient. All nutrients are essential for health, and the “essential” in “essential nutrient” refers to its presence in the diet. The idea that fluoride is a nutrient is no more credible than the idea that lead and arsenic are nutrients. If you were smarter you would cut your losses instead of digging a deeper hole for yourself. As long as studies suggest that fluoride intake at certain reasonable levels in the diet can provide more benefit than harm for human health, we here on NR are considering it a nutrient. In above article I do not make any claims whether municipal water should be fluoridated or not and how much fluoride it should contain.